As mentioned in an earlier post I’ve decided to exclusively use open source software for my work. I’ve recently been messing around with Inkscape to see if it can offer similar or better ways of working. I would have usually hid objects using alt+3 and then reveal them later. There’s no simple shortcut for hiding objects and, unless you enter the xml editor there’s no easy way to reveal any hidden objects. You can’t apply a brush as a stroke. You can quite easily manipulate an object to follow a path and that is quite an amazing feature. However it’d be great if there was the option for the manipulated object to then become the other objects’ stroke. You can’t copy objects simply by dragging them and holding alt, you have to copy then paste them in place of the old object. 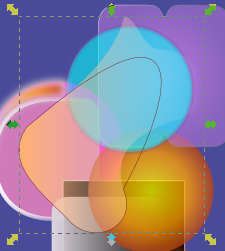 I want to turn the damned bounding box off! I would’ve sometimes used this but sometimes I want the object to be the only thing that’s highlighted, not the box around it. Gradients need to be much easier to edit. The gradient editor is quite powerful and it’s awesome that you can adjust the alpha settings of the current colour, but I I’d like a more visual editor, rather than one that requires a lot of button pressing. The Filter Effects tool is quite awesome… well, at least it has the potential to be. 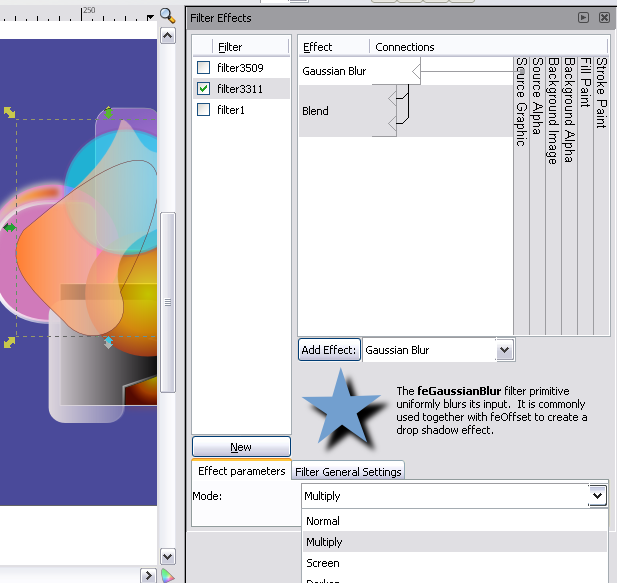 It allows you to create your own filters and apply them willy-nilly. However, I can’t get Multiply, Screen, Overlay etc to work in a way I’d expect. Still, it can be really awesome at times! 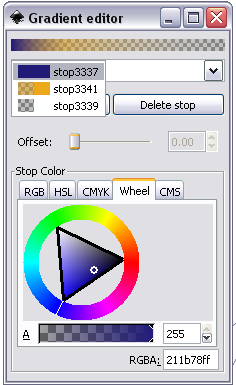 I’m still going to continue using Inkscape as it has a lot of great features, especially for those willing to mess around with lots of numbers.